I sent my article on the subject of student drinking (‘Why Do Students Love Booze?’) to the Prime Minister in a spontaneous moment of activism sometime towards the end of May. 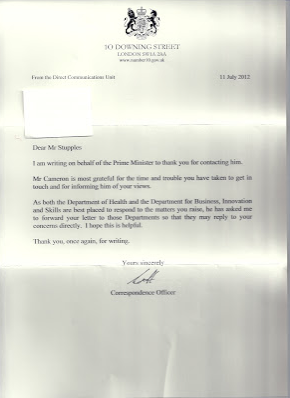 Over a month later, having totally forgotten about posting the article addressed to ‘The Right Honourable Mr. D. Cameron MP’ (his name barely fitted on the envelope), I received this response from Downing Street’s ‘Communications Officer’. Unsurprisingly, the reply did not go into much (if any at all) detail about the aforementioned article, but I look forward to hearing from the ‘Department for Business, Innovation and Skills’ sometime soon. Forgive me, please, for hiding my address. It is only that, after the government suggested we should do so, I have taken the initiative to protect my privacy. I already have enough junk mail (and letters from indebted banks) already. « Are Football Thugs Extinct?